I am taking a domestic flight departing from London Heathrow Terminal 5, probably T5A. A family member is taking an earlier international flight that same day, probably departing from satellite terminal T5B. If I accompany him to his gate, how can I make it back to T5A to catch my flight? Update: Sorry, I didn't make the problem clear. There is an automated people mover connecting the main terminal to 5B, a kind of mini-train. However - my understanding is that outbound and inbound flow is segregated, as incoming passengers have not yet cleared UK immigration. From memory, when the train arrives at a satellite terminal, doors open on one side of the train to allow outbound passengers to proceed to departures. The doors then close, and members of staff ensure the train is empty. Doors then open on the other side to allow incoming, non-immigration cleared passengers to enter the train. If I were to attempt to enter the train from the departures side, I am expecting to be made to leave again by staff. Do I remember wrongly, or is there a way around this problem? Domestic flights from T5 can only leave from T5A so you will indeed have to return to the main building. However any flight can leave from 5A so you might not have to go to 5B or C.
If you find yourself in 5B or 5C, you can walk back through the pedestrian tunnels in the basement. These are called the “Transit Walkway” on the signage, but I think everyone calls them the tunnels or the passageways. At a brisk pace it is probably about ten minutes back to T5A from 5B, more like 20 minutes from 5C though. The passageways are open to the public and sign posted, although not clearly. You mostly encounter staff and people being transported on electric golf buggies down there. However a growing number of T5 regulars know and love the tunnels, as a faster, quieter and more reliable alternative to the train. Unlike the train you can go in both directions. 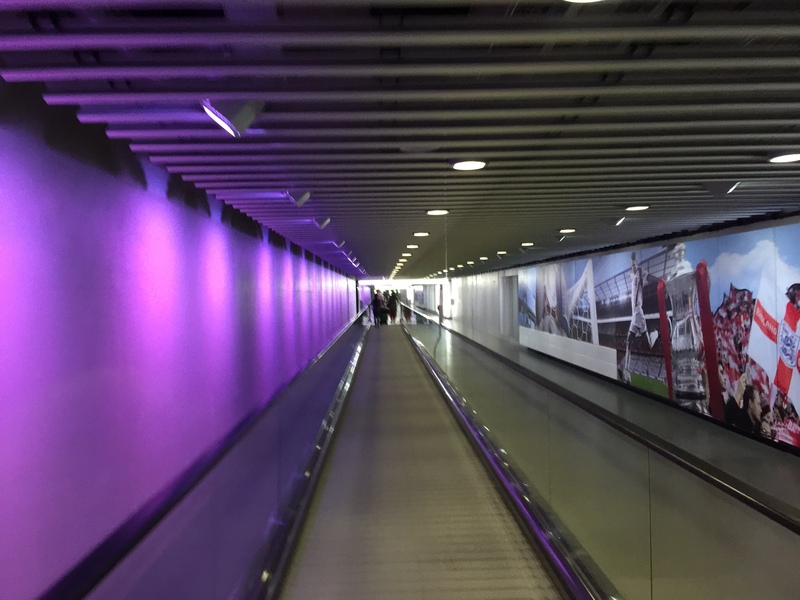 Here you can see they tried to make the passageways a bit more friendly with stylish purple lights and moving walkways. The moving walkways only run in the “main” direction though, you’ll have to walk around them. It is faster to take the lifts down rather than the escalators or stairs, you want button “-4” in 5B. Then you walk down a short flight of steps following the sign for “Transit Walkway”. Note that in 5B you have to use the lift by Boots (gate B36) not the lift by Harrods. In 5C, you have to go down to the train platform and then there is a set of double doors at the end of the platform which leads into the passageway. There are separate tunnels for arriving and departing passengers and there is no way to get mixed up. A member of staff will be happy to direct you if you ask. A photographic guide to the tunnels is available on FlyerTalk, be sure to read posts 3 and 4 which concern exactly your question. A couple of years ago, I was in a similar predicament: I had a long time to wait before my departure from T5A, so decided to explore T5B out of curiosity, and only realized that the trains are one-way after getting there. I asked a member of staff for help, and she helpfully informed me that there are pedestrian tunnels running alongside the train tunnels. She told me to go back down to the station and find a security guard who would direct me to the pedestrian route. In the event I didn't find any security guards, but the door to the pedestrian tunnel was easy to find and not locked. The tunnel itself was impressively large (I think it's sized to be suitable for emergency evacuation). I didn't see anyone else there but I didn't get the impression that I was trespassing on forbidden territory: it seemed to be designed for public access, even if the possibility isn't publicly advertised. Not the answer you're looking for? Browse other questions tagged transit airports london lhr airport-terminals or ask your own question.